The Pea crop is an important vegetable crop. It is becoming a high value crop for the farmers. 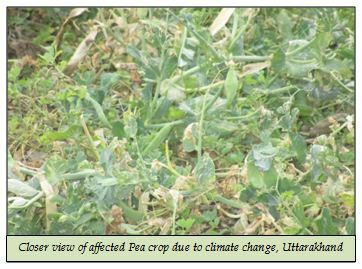 The upcoming trends of agribusiness have given good return to farmers in pea. From entomology point of view, the cool season of winter climate is conducive for the growth of the aphid in normal sowing time. However, the wilt attack is common and more serious in early sown pea crop due to more temperature. In Uttarakhand hills, the crop is taken as offseason crop. 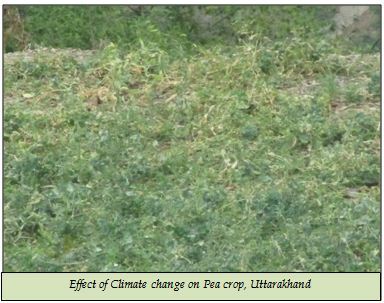 The farmers in Purola and Naugaon blocks of Uttarkashi district in Uttarakhand goes for pea sowing in December –January and then its harvest it in April. Such is the trend in most of mid and higher hills areas of Uttarakhand. But there was sudden fall in temperature in previous march 2017 in Uttarakhand. The temperature was low and even there was significant snow fall high up in the hills. In general, late season sowing crop of pea is more prone to attack of Powdery mildew. But the sudden drop down of temperature created conditions conducive for Aphid attack. This had adverse affected on the crop. Even the unpredicted snow fall has affected the crop. of September for early sowing but with climate change, things are changing .Now, the farmers are following mid October month or even late time for early pea sowing. Time has come to have better understanding of climate change for adjustment of sowing of crops for profitable and sustainable Agribusiness.